Want to feel confident serving a great wine at your next dinner party? Want to also know a great food pairing to go with it? If you enjoy wine and sharing it with friends and family, “Wine With Friends” may very well become your Go-To Solution to those two questions. “Wine With Friends” will give you several great wine choices that cost less than $20. OK, why should I buy this book? 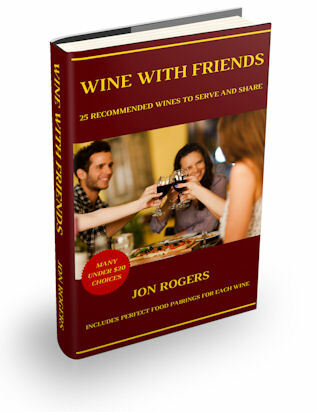 This book includes my curated list of 25 wines I’ve reviewed that I most recommend based on quality and price. Plus, for each wine recommendation you’ll also get a suggested food pairing to really bring out each wine’s qualities and impress your guests. You’ll also get special chapters that explain the Wine Tasting Process and a Food and Wine Pairing Primer. Put it all together and for less than the cost of a glass of wine at many restaurants, “Wine With Friends” will give you the wine choice fast path for your upcoming events. You could even cheat a little and use what you’ll learn in this book the next time you’re at a restaurant choosing a wine to go with dinner. So, this is a Kindle book? Correct! Since launching Honest Wine Reviews in 2012 I’ve seen that 70% of people who visit are on mobile devices. So, I decided to give the people what they want… a book optimized for the mobile experience. What if I don’t own a Kindle? Will this work on other devices? Yes! You don’t have to have a Kindle to read this book. Kindle has apps for iPhones, iPads and Android devices. I have an iPhone and an iPad and I can say with confidence that Kindle books look great on those devices. Where do I find the book and what does it cost? Honest Wine Reviews is a participant in the Amazon Services LLC Associates Program, an affiliate advertising program designed to provide a means for sites to earn advertising fees by advertising and linking to amazon.com.